DBDesigner 4 compares to products like Oracle's Designerï¿½, IBM's Rational Roseï¿½, Computer Associates's ERwinï¿½ and theKompany's DataArchitectï¿½ but is an Open Source Project available for Microsoft Windowsï¿½ 2k/XP and Linux KDE/Gnome. It is release on the GPL. DBDesigner 4 is developed and optimized for the open source MySQL-Database to support MySQL users with a powerful and free available design tool. All MySQL specific features have been built in to offer the most convenient way to design and keep control of your MySQL-Databases. Because DBDesigner 4 is an Open Source Project you are welcome to become a member of the DBDesigner 4 Forum to share your experiences, report bugs and submit feature requests. Or you can download the source from the download page and fix bugs yourself or build additional features into the program. 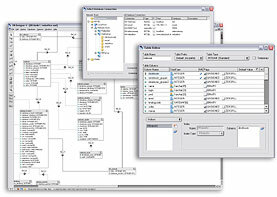 Browse through the following sections to get more information about DBDesigner4.